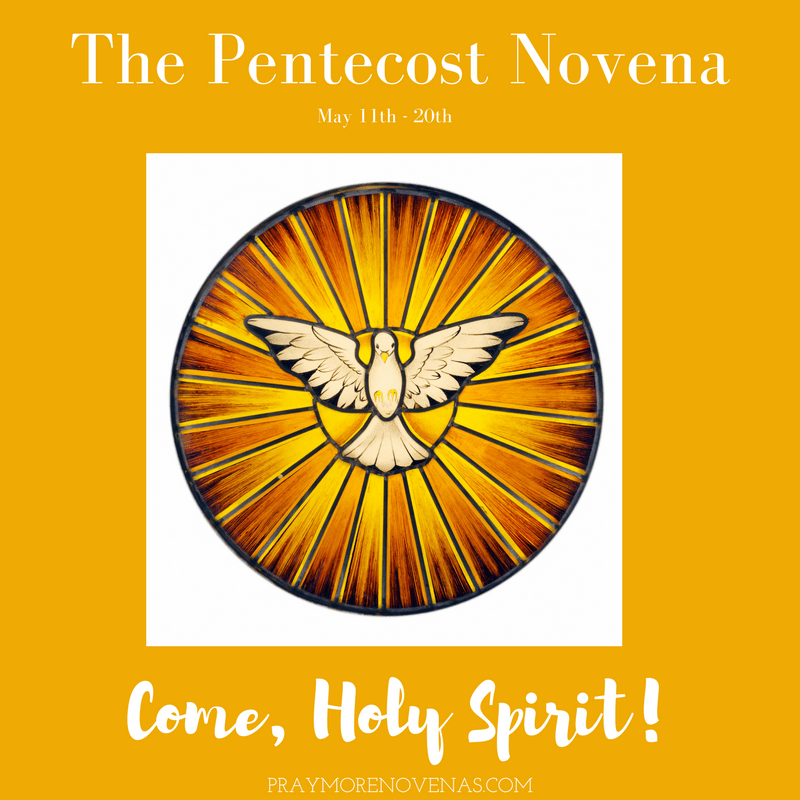 Here’s Day 9 of The Pentecost Novena! Please help me to become a better person and bless and help all my family. In the name of the father. Amen. I ask you most sincerely to hear my prayers. Please pray for my husband David’s own higher good that he may be renewed, refreshed and return to faith. That he will talk with someone about his childhood and army issues. Please send someone to help him now. May as he returns to God he returns to me, his wife. May we have joy, love, friendship and reconciliation in our marriage. I forgive him and hope he will forgive me. Please let him feel the love and blessings for him i have deep in my heart and that he would come home to me. For myself, i would like you to send me people to guide me on what path i need to be on. Please send someone to help lily, she needs to go to the doctor and have counsellors. Thank you to everyone who prays and bless them. Hope to God, that any hardship you are feeling will end soon. All blessing now and forever. Thank you for a successful meeting which allayed my fears and made me feel less silly. Help me to grow in faith and righteousness. Bless all my family and friends especially those experiencing difficulties. In the name of the father.Amen. I am experiencing a difficult time of my life . You are aware of my trials and tribulations facing me now . I ask You to intervene to deliver 2 miracles , one to heal my second stroke of over 5 years duration and two to heal my incontinence issue too . I pray for success and a positive turnaround in my life . Local Time : 8 . 40 p .m. Holy Spirit, our Advocate, heal and save our marriage and family. An on-going and suddenly discovered affair has torn our family apart. I’m so stunned and in great anguish. I turn to you, Father, Son and Holy Spirit to help me. I ask for help to forgive. I pray if it be Your Will, that we can be a Happy, loving family. A blessed, happy marriage. Take away the negatives: resentment, grudges, contempt, an affair, frustrations and anger that drive us apart. During this period, may E not take financial support from his family. He’s going through a crisis that made him lose focus and priority. He lost his faith, his love for family. May the Holy Spirit guide him. Unite us. Heal and save our marriage and family. Guide us. Please make haste to help us. I come to You because all things are possible with You. Please grant a favorable response to my prayers. Thank you Lord for this Novena for Pentecost during this time of my brother Bob’s passing away, preparation of travel and his funeral, and consolation for all his family and friends. Come Holy Spirit…. I have an elderly cousin that I help care for. She is requiring 24 hour sitters in addition to the cost of the facility, and financially cannot continue with this level of care for more than three more months. I prayed for a solution to my dilemma. On day 6 I got a call about possibly sharing a sitter with the resident across the hall!! This would cut sitter expenses in half!!! Praise God for miracles! Holy Spirit, thank you for accepting my novena and prayers. Though I am still praying for the favor to be fulfilled for my son . I trust and have faith that God will bless and fulfil this promise of acceptance in medical school for my son today and that he will excel and become medical doctor and complete MD education soon, with You as his advocate and guide for this favor in this path to medical school. Let this be complete and done soon. Starting new job on Tuesday. Boarding and rooming for six weeks. Moving at end of June. Dealing with cpa sk regarding former business partner who was fraudulent. Lord Jesus I place my financial needs into your hands. I pray for my son and his wife..i pray that hi would get the necessary finances to help him meet his financial obligation.I pray that he would be successful with his future endeavours. I pray that my daughter would get .ones in her exams .Holy spirit i place my marriage and my financial needs into your hands.Holy spirit take control of my life and my family. Dear Holy Spirit please send me your Angel to guide me Help me I’m so very nervous and got severe anxiety for my incoming nursing board examination on June 3and 4…14days to go but I still a lot of reviewer I didn’t finish ..Give me miracles that I can finish and everything will be ok on my examination day…Guide me and give me strong ..I still continue praying for my exam that you give me retentive memory and more knowledge I can answers correctly my exam ..I shade properly my Scranton…Help me to be the topnochers with the average of 88percent ..I trust in you..Amen ..